White flour and sugar are giving way to natural sweeteners, whole-grain flours, and other healthy and delicious alternatives in today's baking pantry. The editors at Martha Stewart Living explore the distinctive flavors and alluring textures of these healthful foods in 130 recipes that showcase the many ways they can transform traditional baked goods. Chocolate chip cookies gain greater depth with earthy farro flour, pancakes become protein powerhouses when made with quinoa, and lemon squares get a wonderfully crumbly crust and subtle nutty flavor thanks to coconut oil. 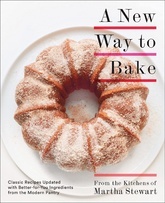 With a DIY section for making your own nut butter, yogurt, coconut milk, and other basics, A New Way to Bake is the next-generation home-baking bible. Color photos.